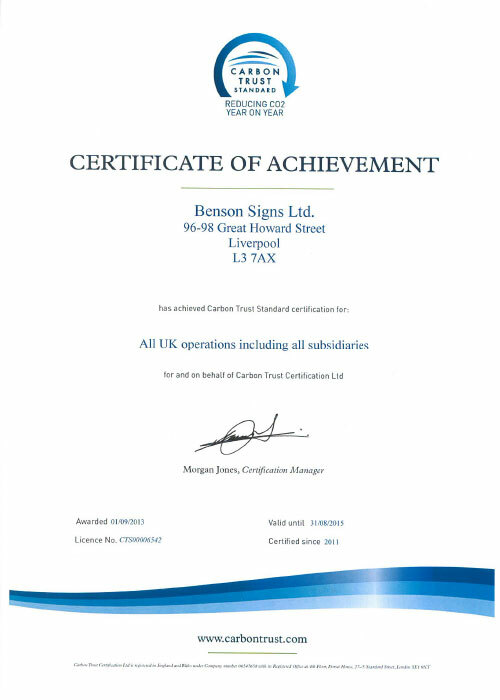 Benson Signs officially recognised for its carbon reduction programme. We are extremely proud to announce that we have been awarded the Carbon Trust Standard for our commitment and contribution to reducing our carbon emissions year on year. This is the second time we have been awarded this highly prestigious bi-annual accreditation following a lengthy and rigorous assessment by The Carbon Trust, who concluded that, further to the 5% reduction in our carbon emissions we achieved during the period 2009-2011, we have surpassed this by some considerable margin. For the period 2011-2013, we have reduced our total carbon emissions a further 7%, based on 2011 figures. This is despite an overall increase in business activity, which just goes to highlight the significance of the steps we have made. -Eliminated up to 40% of our gas consumption through the installation of a 200kw carbon neutral biomass wood pellet heating system. -Purchased a 100% zero emission electric Renault Kangoo van. -Increased the factory roof insulation. -Continued installation of new, clear skylights to our factory roof reducing the need for artificial lighting. -Continued the systematic replacement of all lighting throughout the building, to highly efficient LED units, which we manufacture ourselves. -Replaced our compressed air system with a new machine that is almost 50% efficient. -Increasing our biomass capacity with an additional biomass system. -Developing our electric vehicle (EV) use to include journeys further afield, taking advantage of the ever-increasing network of EV charging points. -Conducting an infra-red thermal image survey of our entire building. Environment, Health, Safety & Quality Coordinator, Graham Barker said: “This is an extremely proud moment for us. We have long been walking the walk when it comes to sustainability and innovation. However, with this re-certification to the Carbon Trust Standard, along with our ISO14001 Environmental Management System, we really are in an elite club of highly skilled, innovative and forward-thinking organisations”.